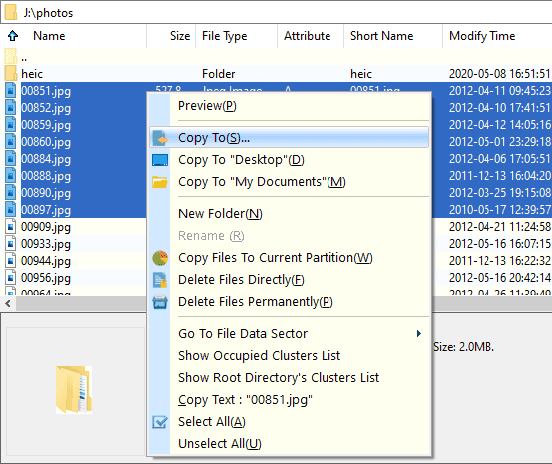 Files and folders displayed in DiskGenius can be saved and copied to a specified location. Select data you want to copy and right-click it to choose "Copy To". Select a location to save data and DiskGenius starts to copy data. How to recover deleted partition in Windows 10/8/7? How to Retrieve Data from Hard Drive (Free)? How to fix error 0x80004005 step by step? How to fix 0x80070005 error easily? Fix error code 0x800705b4 in Windows Update and Windows Defender How to Recover Data from a Damaged SD card? How to clone HDD to SSD?